Thank goodness for HOME. When you’ve got a bug (and I’ve got a nasty one that keeps tricking me into thinking its going away) there is nothing better than being at home. Now if it wasn’t for the fact that I have two young children, I maybe could actually get some rest and kick this thing. When I do have a moment to relax and take care of my body, I am reminded once again how important my home environment is. A serene home environment can make all the difference is keeping me calm and can do the same for each of us; including children. If your child is sick or tired, the last thing you want to do is put them in a bright yellow or orange room. That doesn’t mean a child’s room can’t be fun or creative, but remember what the purpose of the room is for your child. Is it to sleep, or play and sleep? Here’s some pics of some great spaces. Now relaxing doesn’t always mean cool colors like blue’s and greens, but cool colors certainly do the trick. 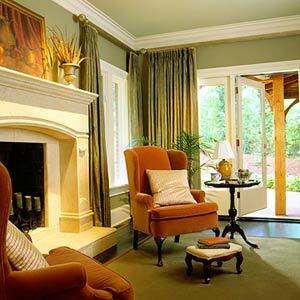 Warm colors can soothe as well if paired and designed appropriately. So, one more thing you need to add to the long list for how you want your spaces to feel is how you want it to feel when you or your family is down and out. This entry was posted in Color, Interior Design, Uncategorized. Bookmark the permalink.